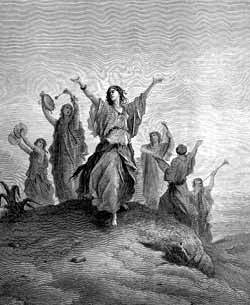 Jephthah’s daughter comes hurrying out to meet her father, singing for joy. IN THE LANDof Israel east of Jordan there lived a man named Jephthah. His brothers despised him and drove him away from their father’s home, so he went to live in the land called Tob. Here he became a strong man, and his brave deeds were told by many people. Finally even his brothers heard about them. At this time the Israelites were in great trouble again. They had quit going to the tabernacle at Shiloh to worship God. Everywhere in the land they were bowing down before the gods that other nations worshiped. And the very nations whose gods they were serving began to trouble them. They began to make war against the Israelites and to take away their riches. The Ammonites came from the east and the Philistines came from the west and ruled over the Israelites. The Ammonites even threatened to take away the homes of the Israelites and to drive them out of their country. This was an unhappy time indeed for the people who had once enjoyed the blessings of God. After suffering for eighteen years under the rule of their enemies, the Israelites remembered how God had long ago given them all the land and had made them stronger than all the nations who lived around them. So they cried to God for help, and they expected God to send a deliverer, just as he had done at other times when they were in trouble. Now the Israelites became very sorry for having sinned against the true God. They saw that the gods they were serving could never help them at all. They knew that true God whom their fathers had worshiped could deliver them out of the power of their enemies. So they tore down their idols and began to serve the Lord. They confessed their sins to the Lord and asked him again to help him. When the Lord saw that the people were really sorry for their sins, he began to pity them. He saw them gather their soldiers together at a place called Mizpah, to fight against the Ammonites. But they had no leader. Finally some one remembered Jephthah whose brave deeds had been told through all the land. They sent quickly for him to come to lead them to the battle against the Ammonites. But Jephthah was not willing to come. Not until his brothers had promised to treat him kindly would Jephthah return again with his family to his old home and help his people out of their trouble. Jephthah knew that unless God would be with him he could not gain a victory over the Ammonites. So he asked God to help him, and he promised to give as a present to God the first thing that should meet him on his return home from the battle. This was not a wise promise; for Jephthah did not know what might come first to greet him on his return. The Ammonites sent a message to the Israelites at Mizpah and wanted them to give up all the land east of the Jordan River; they said this land belonged to them first. But Jephthah sent back an answer that God would be the judge, for he had given the land to the people of Israel. Then the battle began; and the Israelites won the victory. News of the victory reached Jephthah’s home before he returned with the army of Mizpah. And everybody was glad because God had helped them again. Jephthah’s daughter, his only child, came hurrying out to meet her father, singing for joy. But her song ended quickly when she saw her father’s troubled face. He had remembered his promise to the Lord. Now he believed that he must give his only child as an offering to God. How sorry he felt because he had made such an unwise promise! He tore his clothes and cried out in distress. Then he told his daughter about the promise that he had made. The people of other nations sometimes gave their children to their gods; but the law of Moses forbade the Israelites doing such a thing. Perhaps Jephthah had never heard that part of the law read, and he had often heard about the cruel custom of his heathen neighbors. He believed that he would need to keep his promise, although it was not a wise one. And his daughter urged him to keep it. because God had given him the victory over their enemies. But first she asked for two months time to spend alone with her friends in the mountains, weeping because she must soon be taken away from them. Afterwards she returned again to her father that he might fulfill his promise to God. Jephthah judged Israel for six years after his victory over the Ammonites, and then he died.